Why shouldn’t your finished basement be just as beautiful and enjoyable as the living space upstairs? To achieve this goal, many homeowners elect to replace small basement windows with larger window units and have StakWel window wells installed on the home exterior. Meets all building code requirements for basement bedroom egress. High-strength plastic construction will never rust or require painting; totally maintenance free. Interlocking modules make it easy to create wells of varying depths. "Grip/Step" design facilitates easy exit from well. Optional clear polycarbonate cover keeps well free of leaves, snow, and debris. Suitable for new or retrofit applications. If the plan for your finished basement includes a spare bedroom or a basement apartment, the building code that applies in your area will probably require an “egress-compliant” window along with a properly designed window well. This modification will allow occupants to safely and quickly exit the basement in the event of a fire or other emergency. Of course, you may want to have larger windows installed in your basement wall simply because it brings more natural light into this space, providing an open, airy feel. In either case, StakWel window wells provide a finished exterior treatment that’s beautiful, durable and maintenance-free. 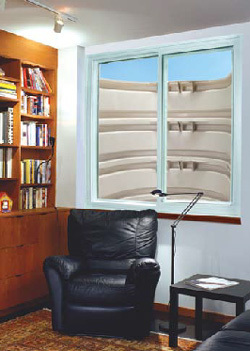 StakWel window wells are designed as a modular system that can meet different depth requirements. This flexibility is sometimes important when a house is built on a sloping site or when basement window sizes vary. Call for a free basement inspection and basement window estimate. StakWel window wells are just one of many elements in any basement transformation. Contact the basement experts today at MidAmerica Basement Systems.